First up, check out this gorgeous antique silhouette and chalkboard dresser that Dear Emmeline created for her daughter Elise. Yes that is Elise's silhouette and vintage fabric covers the top drawers too. What a treasure for a sweet little girl! 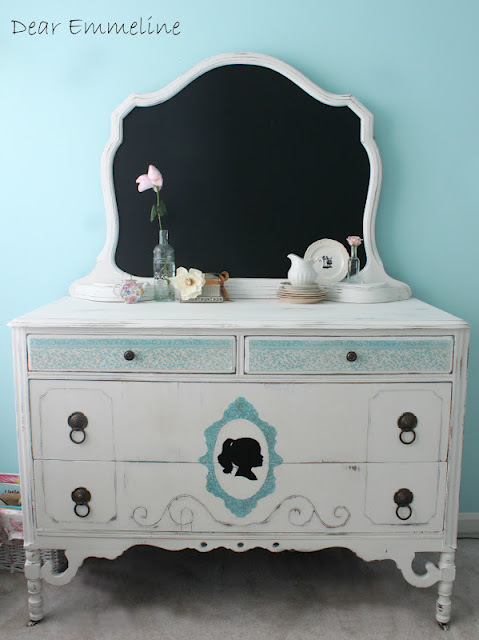 Stacey from Embracing Change also worked some magic on a vintage dresser with lovely handpainted details - soft and pretty! 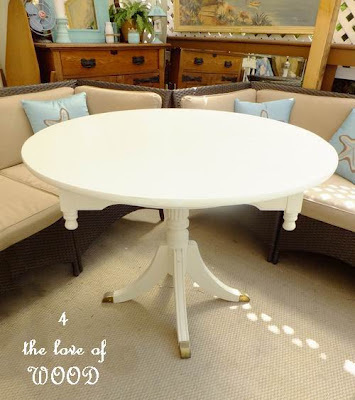 Next you'll want to head over to 4 the love of WOOD to see how Kristy transformed a country style table with 4 legs into this beautiful pedestal table! Cyndi from Blue Star Antiques took a very plain brown chest and gave it the look of a mini-card catalog. Talk about a total transformation! Lora Leis from Leisure Living went classic black with mercury glass knobs on this vintage dresser and the result is just stunning! Susan from Uniquely Yours...Or Mine braved the heat to paint this cool dresser for a baby boy's nursery. 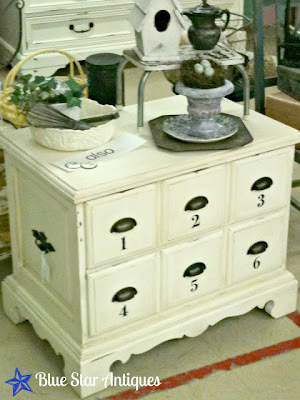 I love those little drawers and the chunky wooden handles! It even has pulls on the sides. 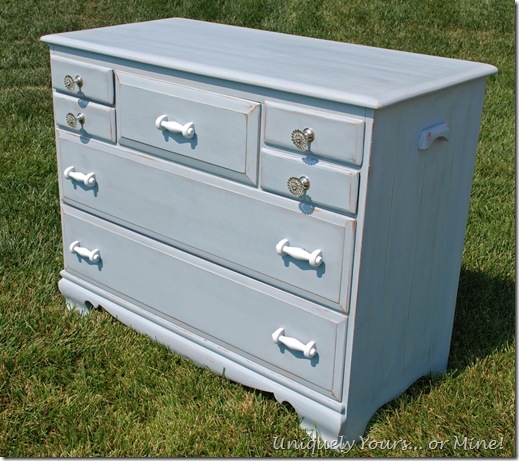 And here is a completely different take on a blue dresser for a family with a new baby. This one is from Danielle at Silver Pennies. Just look at those pretty details! And before you think I got totally carried away with furniture this week, check out this vintage typewriter from Daisy, Mae, Belle - totally adorable! These cute photo frames come to us all the way from Holland. Nelly from Brown Girl Decorating has an extensive stash of washi tape and she knows how to use it! What a great gift idea. I think you could get the kids involved in this one! 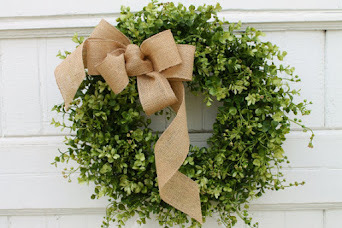 And I love this unique chalkboard wreath that Angela from Number Fifty-Three created for her front door - sweet, simple and totally charming! Thanks so much to everyone who linked up and linked back. I love having you here! Feel free to grab a cute little button from the sidebar if you've been featured. And I've added a Pinterest board to showcase the featured links each week. It will probably take me a week or so to go back through all the parties. I'll add a Pinterest link to the sidebar soon (in other words, as soon as Megan can help me with that). If you'd like to be considered for a feature, be sure you have a visible link back to the party! * Grab a party button and add it to your post or link back in some way. You must have a visible link back to be considered for a feature! * And be sure to follow along with us! We'll be back next week with features and a brand new party. Now let's share some inspiration! LOVE all of these features!Great inspiration.Thank you for hosting. 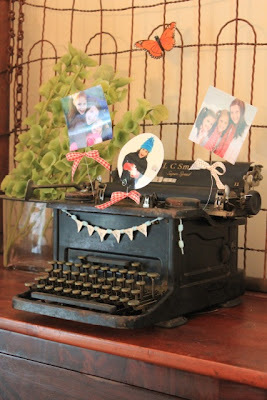 i love that typewriter mantle, so sweet. thanks for hosting! So nice to make your acquaintance and to make it to your party. Thank you. 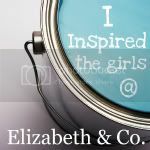 I love the name of your blog...Elizabeth is an important name in our family too. Wow, what a collection of furniture pieces! I am in love with that first one. Have to go check that out. Thanks for giving us a place to party! Hi Sharon...wonderful features this week...thank you so much for hosting!!! Sharon, thank you so much for hosting!! Oh my goodness Sharon...you have some amazingly talented linkers. All of the features are beautiful. Thanks for hosting - Have a wonderful week! 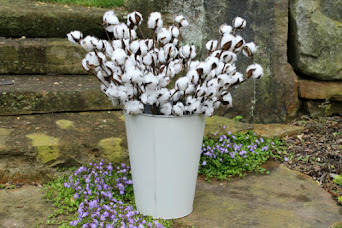 Thank you for featuring my pedestal table. I've added your button to my main page. Thanks for the link party!! Sharon, great features as usual. Always like to visit your party people. fabulous features! 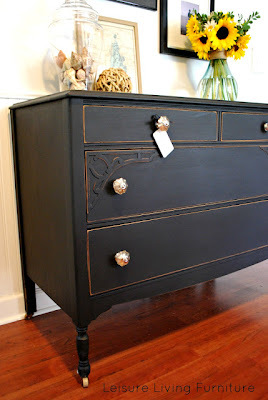 i love that black dresser and dear emmeline's dresser, too! Thanks for hosting...happy that I had something to share this week. 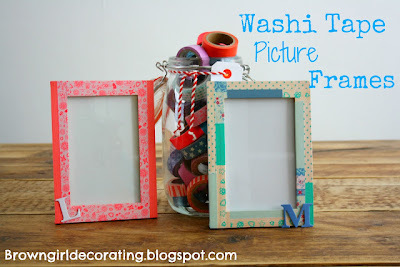 OMG thank you for featuring my washi tape picture frames. 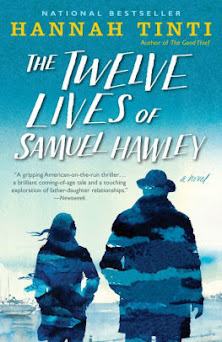 So great seeing them on a blog I love. My first time here to link up...thanks for hosting! Our summer sale is a wrap! Inspired by a Country Living cover!